Here are some pictures of the show up at Jones Gallery in Pasadena right now. I believe the show is called “Beautiful Freaks” and features the work of a number of artists, but because I am someone with carpal tunnel and a short attention span, I’m just going to focus on the works shown above which are by artist Robin McGeough (pronounced “McGoff”). I first saw his images on a postcard on someone’s desk. The images were darker, smaller, and slightly discomfiting. I had been told that the work was about addiction and the damaged self-esteem experienced by addicts. I walked into Jones’ expecting the pieces to be tiny and dismal, but instead they were big and vibrant. You can’t tell from my crappy cell-phone pictures, but the walls at Jones’ are huge and some of these pieces are as big as me. The pieces have an invigorating effect and Robin is a gracious guide, sharing the intentions and thought processes underlying his work. 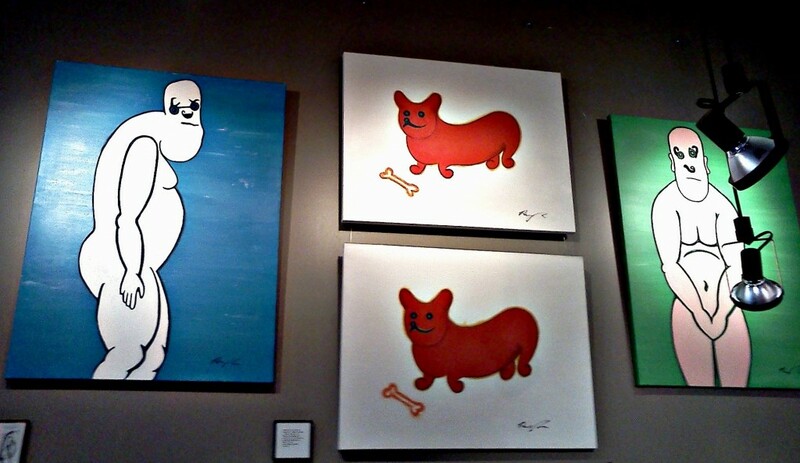 The bold, cartoon-ish style of the paintings acts as an immediate contrast to the subject matter. For example, in the canine paintings, the yellow dog has a broken back and is suffering terribly from pain as evidenced by his grimace. To his left, a young red dog happily barks at and approaches the bones of his own death, (or death in general) in blissful unknowing. The two pieces side by side act as a kind of statement about suffering and ignorance. The pictures are simple and lighthearted, and yet manage to address serious themes. Now to the first picture posted, to hear Robin explain it — the two male figures on the right and left are people whose feelings of shame and self-disgust have penetrated their posture, body language, and facial expressions. The two center pieces feature Corgies, animals described as a “happy freaks” in their own right according to the small piece of text that accompanies this group of paintings. In the dualism and the parallelism of this wall arrangement, it seems a comparison is being drawn. The dogs bring their bones to their master, happily, without care or worry. In contrast, the human figures on the right and left are trapped in self-consciousness and shame. They appear to be men, but in both cases. . . there is no “bone” in sight. Some connection to joy is missing. They are outlined in a thick, defined black whereas the radiant, matched Corgies seem to have a luminous glow that radiates from less oppressed silhouettes. Art curated by Jeffrey Cavalier. Thanks, Jeff!